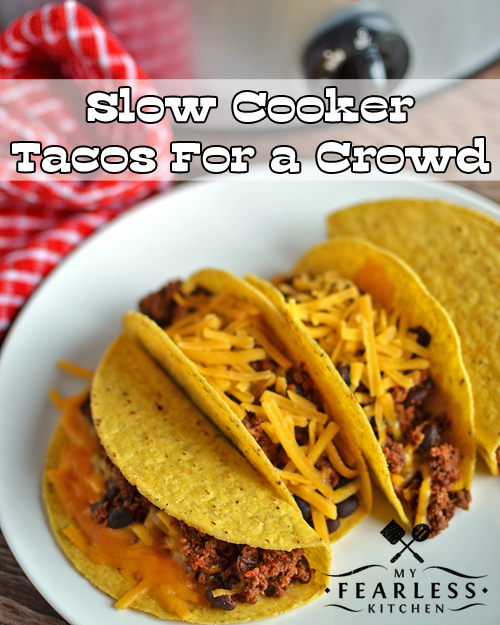 These Slow Cooker Tacos For a Crowd are so easy and fast to make. 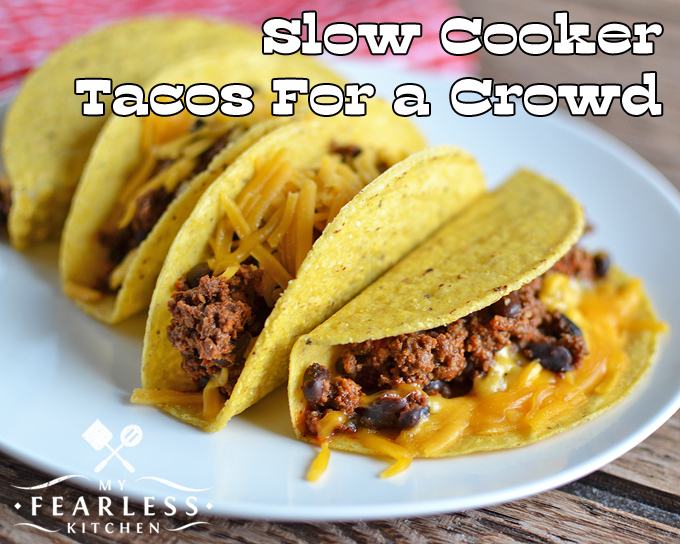 Let your slow cooker do all the work and you’ll have plenty of tacos for your whole party! We love tacos around here. Any time I can make a whole bunch of taco meat and work with it for leftovers, I call it a win! This recipe for Slow Cooker Tacos For a Crowd is easy to make, and makes plenty for dinner tonight, lunch tomorrow, and even more! My favorite part about this recipe is that you can do it all in your slow cooker – no pre-browning of beef needed! I put the ground beef in my slow cooker on low for about 2 hours. Every once in a while, I mashed it up with my Pampered Chef Mix n Chop so it would cook evenly. When we have tacos or spaghetti sauce with ground beef, we like the ground beef chopped really fine (instead of bigger chunks). Using the slow cooker is a great way to get the meat this finely chopped! Use your Mix n Chop to get it as fine (or as chunky) as you want. The longer it cooks, the more it will break up! If you need to just toss everything in the slow cooker and head out the door, you can still make this recipe. Just brown up your ground beef in a skillet. You can even do this the night before, then refrigerate the cooked beef until you’re ready to add it to your slow cooker! If you have one of these fancy slow cookers that can brown meat, by all means, use that one! I used very lean ground beef, so I didn’t drain the grease before I added the rest of my ingredients. If you want to drain, have at it. If not, don’t worry about it! Add some black beans, some canned whole tomatoes, and taco seasoning. Don’t worry about having big chunks of tomatoes when you’re done. All the slow cooking will break those tomato chunks down, and you practically won’t know they are there! But they do still add a punch of flavor. I used 8 Tablespoons of Penzeys Taco Seasoning. You could also use 2 packets of taco seasoning from another brand. We recently discovered Penzeys Taco Seasoning, and think it has such a great flavor! You do not need to add water (like you would if you were just browning taco meat in a skillet). Between the beans, the tomatoes, and the steam that the slow cooker generates, you won’t need any extra. All you really need is some taco shells (we like the Stand and Stuff kind) and plenty of shredded Cheddar cheese. Top them with fresh diced tomatoes, chopped avocado, shredded lettuce, or any of your favorite taco toppings! What is your favorite taco topping? 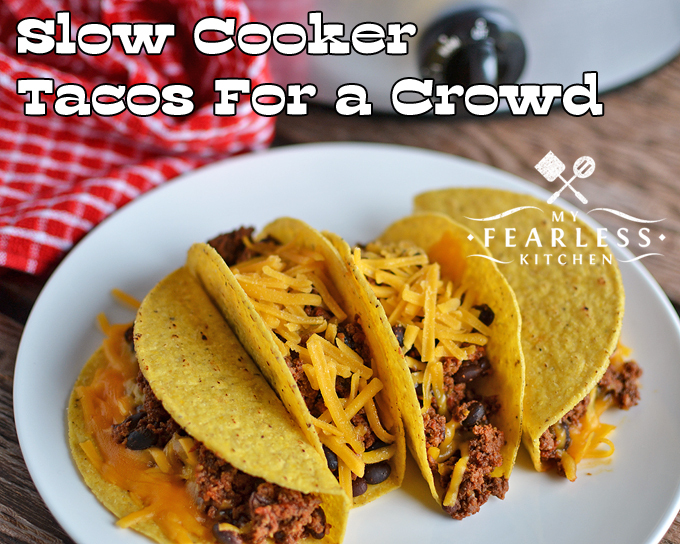 This recipe for Slow Cooker Tacos For a Crowd is easy to make, and will give you plenty of leftovers! Place ground beef in a 6 quart slow cooker. Cover and cook on low, mixing occasionally, for 2 hours. Add taco seasoning, salt, and pepper. Mix well to coat meat with seasonings. Add black beans and whole tomatoes. Mix well. Cover and cook on low for 4-6 hours, stirring occasionally. Spoon meat mixture into taco shells. Serve hot, topped with shredded Cheddar cheese and any other garnishes you like. How many servings in the recipe? It makes approximately 12-14 tacos. Thanks for asking, I updated the recipe card!